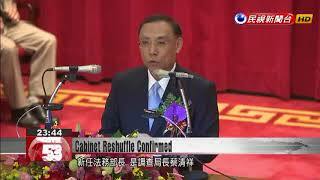 Premier Lai Ching-te today announced a major Cabinet reshuffle that would swear in nine new top officials. Among the ministries that will get new leaders are justice, finance, transportation, education and the interior ministry. This Cabinet "refresh" falls just before the 9-in-1 elections and is seen as a bid to boost support for the DPP. But the premier today insisted that his personnel rotation is aimed at meeting the needs of government, not elections. The Ministry of Education has been without a head for more than a month now, but it will come next week in the form of Yeh Jiunn-rong, currently the interior minister. Interior Minister Yeh Jiunn-rong has told me many times before that the time he promised me is up. He had promised to help me for a period of time but now he wants to go back to his beloved academia. But in the end I asked Minister Yeh Jiunn-rong if he could help lead the Ministry of Education. He was chosen on the basis of his academic standing, patience, perseverance, ideals, and gift for innovation. Once Yeh leaves his post, current Executive Yuan Spokesman Hsu Kuo-yung will take over as interior minister. And the new Executive Yuan spokesman will be Kolas Yotaka, who is currently a legislator-at-large. The new minister of justice will be Investigation Bureau chief Tsai Ching-hsiang, while the next finance minister will be the current deputy finance minister, Su Jain-rong. Finance Minister Sheu Yu-jer came to me on his own and said he had completed his part of the mission. He said he hoped to pass on the baton to the younger generation. As for Justice Minister Chiu Tai-san, he has pushed many institutional reforms in the Justice Ministry over the last two years. Recently he has come to me repeatedly and said he wants to rest and go back to school to teach. As for the Transportation Ministry, the top post will go to Wu Hong-mo, chairman of the Taiwan International Ports Corporation. Under the leadership of Transportation Minister Ho Chen, we have worked from excellent blueprints over the past two years. In the future, we want to keep accelerating our progress in the Forward-looking Infrastructure Development Program. Of course, transport safety management is also very important. We’ll do both at the same time. Premier Lai will round off his list of nine new appointees with new picks for the National Palace Museum, the Sports Administration, and the Agriculture and Food Agency. He stressed that the Cabinet reshuffle had nothing to do with November’s local elections, but was aimed simply at meeting his government’s operational needs.